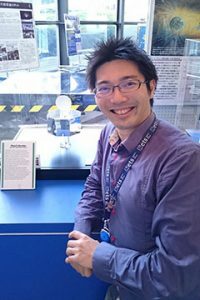 ISAS Deputy Director General, Masaki Fujimoto, and BepiColombo MIO project scientist, Go Murakami, discuss Japan’s MIO probe ahead of the launch to Mercury this October. Late at night on October 18, 2018 at the Guiana Space Centre in Kourou, the BepiColombo mission is scheduled to begin its journey to Mercury. The joint ESA-JAXA mission will launch on an Ariane 5 rocket from Europe’s spaceport at 22:45 local time (10:45 JST and 01:45 GMT on October 19). The BepiColombo mission consists of two probes that will orbit the innermost planet of our Solar System. The European-designed probe is the “Mercury Planetary Orbiter” (MPO) which will follow a close orbit around the planet to explore the surface and interior structure. The Japanese “Mercury Magnetospheric Orbiter” (MMO) –recently nicknamed “MIO”– was constructed here at the JAXA Institute of Space and Astronautical Sciences (ISAS). This probe will follow an elliptical path around Mercury to explore the magnetic environment generated by the planet’s own magnetic field, and the interaction with the solar wind of high energy particles streaming from the Sun. 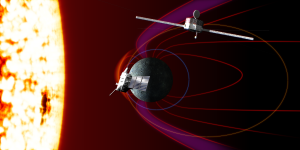 Artist impression of the MMO probe from the BepiColombo mission orbiting Mercury as it explores the planet’s magnetic field. The two probes will be launched as a composite spacecraft with the European-built “Mercury Transfer Module” (MTM) that provides the propulsion. 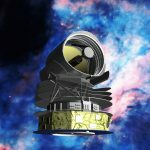 This is a novel design for the mission, which sees the MPO and MIO probes stacked on the MTM, with a sunshield protecting MIO from solar radiation and overheating. Upon reaching Mercury, the stack will separate and MPO and MIO enter orbit around the planet. The MTM is powered by an ion engine; electric propulsion thrusters that accelerate ions of Xenon in an electric field. This is the same propulsion technique that JAXA’s Hayabusa2 used on its journey to asteroid Ryugu this year. The journey to Mercury is a long one, lasting seven years. The duration is not so much a problem with distance, but with speed. Flying towards the Sun, BepiColombo must break against the strengthening pull of the Sun’s gravity. When the spacecraft finally arrives at Mercury, the velocity must be low enough to allow the two probes to be captured by Mercury’s own gravity to enter orbit. This will be achieved by a series of nine planetary flybys, where the gravity of the Earth, Venus and Mercury is used as a hand-break to adjust the velocity and direction of BepiColombo. The first of these manoeuvres will be an Earth flyby about 1.5 years after launch. Previously, the Cosmos blog featured Hiroyuki Ogawa, Project Engineer on the BepiColombo team, and Yoshifumi Saito, the Principal Investigator for the Mercury Plasma Particle Experiment onboard MIO. Ogawa and Saito discussed the engineering challenges in designing a spacecraft that must operate so close to the Sun, and the scientific importance in exploring bodies with a magnetic field. 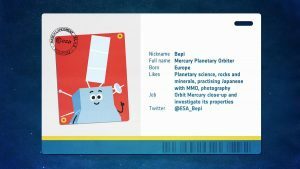 Now the spacecraft is ready for launch, ISAS Deputy Director General, Masaki Fujimoto, and BepiColombo MIO Project Scientist, Go Murakami, answer the most popular questions asked about the mission. Why “MIO”? The new name for the Mercury Magnetospheric Orbiter (MMO). Earlier this year, JAXA ran a competition to ask for suggestions for a name for the MMO orbiter. 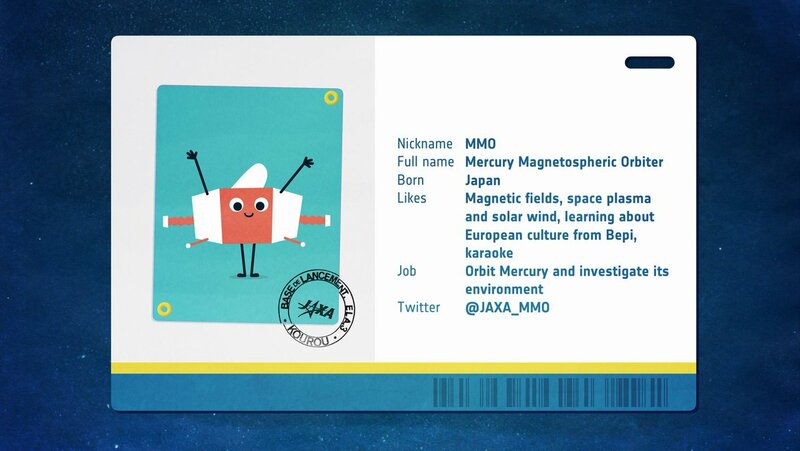 Spacecraft designed by JAXA usually have an descriptive name related to their function (in this case, the Mercury Magnetospheric Orbiter) and then an easily remembered namesake that reflects the mission goals. The chosen name was announced in early June as “MIO”, meaning “waterway” in Japanese. As MIO will explore the interaction between the solar wind and Mercury’s magnetic field, the probe will be like a sea vessel exploring the electromagnetic waves of Mercury’s magnetosphere. 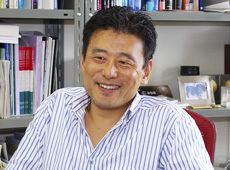 “The name also wishes for the safe long journey towards the target planet,” adds Masaki Fujimoto. 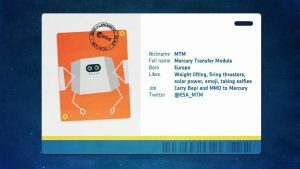 What are the main objectives for BepiColombo, and in particular for MIO? BepiColombo is a two-spacecraft mission to explore the planet Mercury and its environment in space. One of the puzzles is why the small planet has an intrinsic magnetic field and how this is maintained. Activity within a planet is needed to maintain a magnetic field (our own planet’s magnetic field is driven by motion in its molten outer core), but a small planet should have cooled into a static death by this time in the Solar System’s history. There is strong evidence that Mars lost its magnetic field about 4 billion years ago, despite having twice the mass of Mercury. MIO focusses on this magnetic-orientated science theme. The probe will observe Mercury’s magnetic field and see how it interacts with the solar wind; the super-sonic flow of ionised particles from the Sun. In addition to the magnetic field, the subject of planetary origins is very intriguing to me. The most up-to-date theoretical framework for planetary (solar) system formation includes migration processes; the idea that there must have been substantial radial mixing of materials in the proto-solar disc during the formation of the planets. We do not know enough about the basic radial structure of our own planet forming disc, especially in the inner-parts. The exploration of Mercury provides a way to obtain insights into this issue, especially from a chemical composition point of view. This is tightly linked to understanding where the rocky parts of the Earth (and also that of Venus and Mars) originated from. 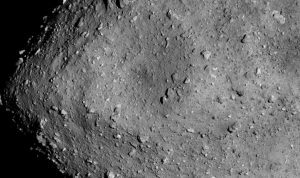 JAXA’s asteroid sample return mission, Hayabusa2, is asking the question of where the water on Earth came from. BepiColombo will ask the complementary question of how our planet’s rocky body was made. Why are we so interested in Mercury’s magnetic field? We believe we have understood the origin of the Earth’s magnetic field; the movement of the electrically conducting molten iron of our planet’s outer core sustains an electric current. This functions like an electromagnet to produce a magnetic dynamo. But does the same mechanism apply to Mercury? Or is there a different way of situating an electromagnet inside a rocky planet? There is a reasonable expectation that the Hermean (from “Hermes” the Greek name for the Roman god, Mercury) situation is not simply a scaled-down version of the Earth mechanism. This is why we care very much. The shape of the magnetic field around Mercury should reflect what is happening within the planet, in the same way that the Earth’s magnetic field revealed the rolling motion of the molten iron fluid at our core. We also care about how the magnetic field interacts with solar activities. In the exoplanet community, there is a strong focus for the coming decade on studying the habitability of planets around M-dwarf stars. These stars are dimmer but magnetically more active than our Sun. The temperate ‘Habitable Zone’ is therefore located close to the star (which helps when searching for planets in this region) but is exposed to the influence of more violent stellar activities. The space weather environment of potentially habitable planets around M-dwarfs is therefore far more harsh than we can study in detail on Earth, the habitable planet in our Solar System. Instead, studying the environment at Mercury would give us a better analogue for what a planet around an M-dwarf must face. What will MIO help to uncover about Mercury’s magnetic field that could not be revealed by the two previous NASA missions to Mercury, MESSENGER (2011 – 2015) and Mariner-10 (1974 – 1975)? The discovery of Mercury’s magnetic field by Mariner-10 in the 1970s was a big surprise. The puzzle continued when MESSENGER data suggested a strong north-south asymmetry in the magnetic field structure. This asymmetry was inferred from data obtained mostly in the northern hemisphere of the planet, due to the orbital constraints of the spacecraft. By contrast, both MIO and MPO will acquire magnetic field data from the southern hemisphere. Complementing the details from MESSENGER is a logical next step to investigating the nature of Mercury’s magnetic field. Both probes have north-south symmetric polar orbits, with their lowest altitude around Mercury’s equator. But the orbits (especially that of MPO) are low in the southern hemisphere compared to MESSENGER. Getting data from the southern hemisphere to complement the details from MESSENGER is a logical next step to investigating the nature of Mercury’s magnetic field. Having two probes also allows simultaneous measurements from different locations. This is a powerful tool in investigating the magnetic field structure when it is under the influence of a time-varying space environment (in particular, the solar wind). It also allows the planetary contribution to the magnetic field measurement to be separated from any non-planet origin in the data, which is essential for understanding Mercury’s intrinsic magnetic field. 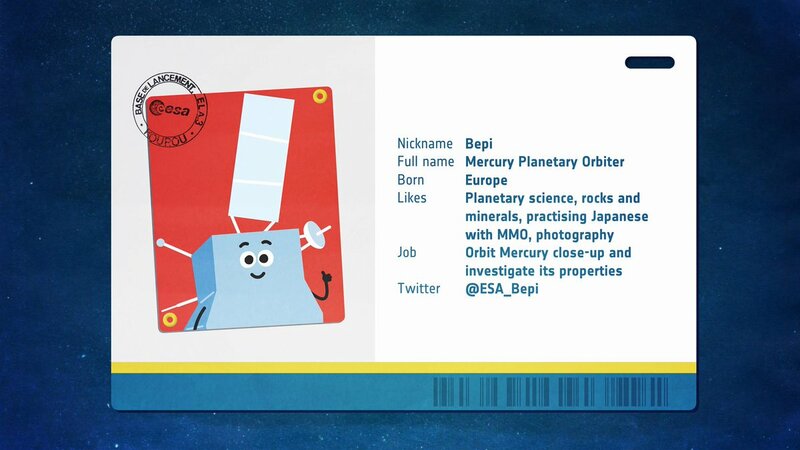 Overall, BepiColombo will complete a full-hemisphere analysis of Mercury and set the ground to a deeper understanding of our innermost planet and planet formation. 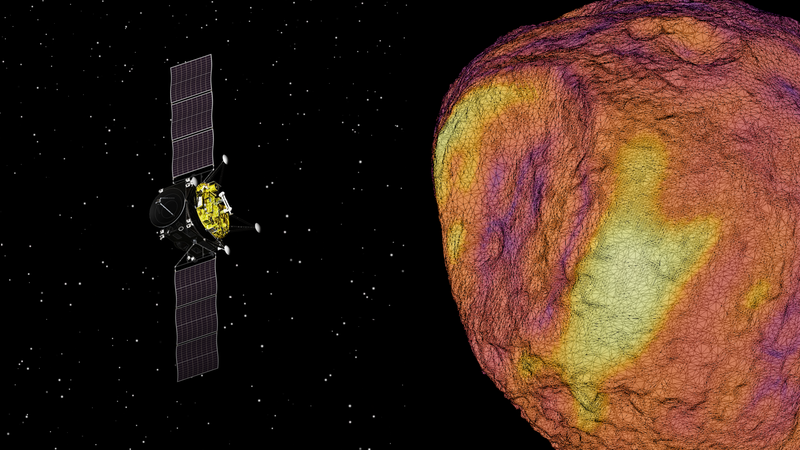 What aspects of MIO’s design make it ideal to explore Mercury’s magnetosphere? Onboard MIO are instruments to study the electromagnetic field, plasma particle detectors and an imaging device for the thin atmosphere that surrounds Mercury. MIO spins rapidly as it orbits Mercury, rotating every 4 seconds. This gives the probe a strong advantage in measuring the direction of plasma particles (particles with an electric charge that feel a force in Mercury’s magnetic field). Thanks to the probe’s spin, plasma particles from almost all directions can be captured and analyzed by MIO’s instruments. The European MPO probe can also detect the magnetic field and this combined two-point measurement from BepiColombo as a whole is a strong advantage for analysing the structure of the intrinsic magnetic field. 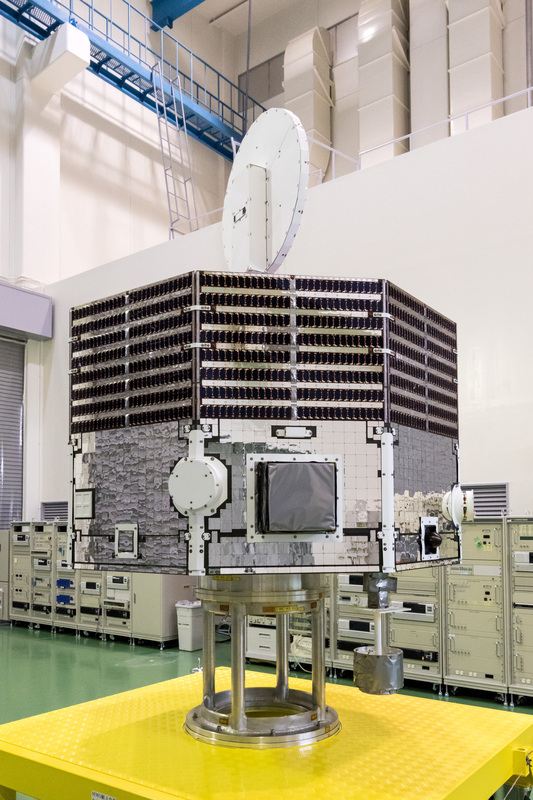 The shape of JAXA’s MIO is similar to that of our previous mission, Geotail, to explore the terrestrial magnetosphere. The expertise we learned through Geotail went into our design for MIO. What were the technical challenges in designing MIO? The thermal design has been the biggest hurdle. Getting closer to the Sun means that much more heat must be received by the spacecraft. Photographs of MIO show the probe is covered by mirror plates so that the solar radiation can be reflected at the surface of the spacecraft. This was a particular challenge with the large high-gain antenna (HGA) used for communication with Earth. The surface had to be non-reflective, but we could not accept the heat influx. Instead, we developed a white paint that is electrically conductive to solve this thermal problem. Development of solar cells that could function under the stronger ultra-violet radiation from the Sun in tough thermal conditions was also a big issue that needed to be tackled. The thermal conditions restrict the communication time interval between the spacecraft and ground antenna on the Earth, so we need to be smart when planning the science operation and data downlink. Space missions are always high-risk enterprises with feats that have never been attempted before. What do you consider the most critical phase of the mission that lies ahead? The Mercury Magnetospheric Orbiter (MMO), built by ISAS. Orbit insertion is always a heart-beating event. Once an orbiter mission is in orbit, you would normally hope that nothing very drastic would happen. However, in the case of MIO orbiting Mercury, the harsh thermal conditions mean that the science observations and data downlink need to be planned very carefully and continuously throughout the mission. Sometimes, most of the instruments will need to be turned-off and only the transponder left operating in order to stay within a safe temperature range. Communication time is also limited, so not all the data that has been obtained and stored in the instrument memory will be allowed to reach Earth. It is only through very careful planning that the precious data from this minimally explored planet will be available in our hands. It may sound dumb not to send all the data that our lovely instruments obtain, after all the effort in desigining, fabricating, sending and carefully operating them. We have to live with this and be careful enough to grab the most critical data at the expense of less important. It’s life, you can’t always get what you want. 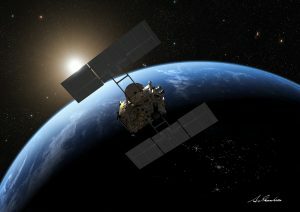 What are the challenges and advantages of the collaboration between ESA and JAXA? People sometimes ask if the launch delay for BepiColombo was painful. My answer has been that BepiColombo is the kind of mission that JAXA cannot afford alone and the patience to see this mission to Mercury launched has been very rewarding. 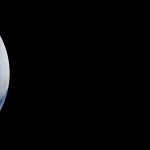 The network established through BepiColombo has led to JAXA participating in ESA JUICE, the Jupiter Icy Moon Exploration Mission. This is another mission at the cutting edge of today’s science questions that JAXA alone cannot fly. Will data from MIO be available for public access? Yes. JAXA cares about collaborating with our international partners and scientific colleagues and we follow the world standard in this regard, to make collaborations easy. How long is the mission life of MIO? One year of nominal observations is planned, followed by an addition year for the extended mission. The amount of propellant for attitude control will limit the mission life of MIO. In addition, based on the calculation for MIO’s orbit, she will finally crash onto Mercury’s surface about 3.5 years after orbit insertion.